In the year marking the centenary of the start of World War I in 1914, six New Zealand soldiers are added to the New Zealand and Commonwealth War Graves Commission’s official rolls of honour. They are Private Arthur Joseph Best, Private David Falconer, Trooper Matthew Gallagher, Private Percy Hawken, Sapper Robert Arthur Hislop and Private Lester Edward Quintall. A ceremony at the burial site of Sapper Hislop in Waikumete Cemetery in Auckland has already acknowledged the occasion of his admission to the roll of honour and recognised him as the first New Zealand casualty of the First World War. His headstone was refurbished. 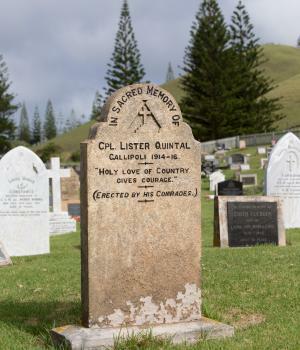 The grave of Private Quintall on Norfolk Island has a headstone erected by his comrades who recorded him as Corporal Lister Quintal. There is some doubt as to the spelling of his name; his service record has him as "Quintall" but his brother and sister are noted in the service records as "Quintal," a common spelling of the family name on Norfolk Island. In announcing the change of status for these casualties, Lieutenant General Tim Keating, the Chief of Defence Force, said the decision to include these servicemen was the result of ongoing research into service personnel files carried out by the New Zealand Defence Force Historian. “In the majority of these cases, the military authorities at the time acknowledged their deaths were as a direct result of their service with the New Zealand Expeditionary Force but, for various reasons, their names were not entered on the rolls of honour. “It is important that these soldiers are now formally recognised. They, like more than 18,000 of their countrymen, died as a result of their service to New Zealand in the First World War,” said Lieutenant General Keating. The background on Private Quintall prepared by New Zealand Defence Force Historian John Crawford states Private Lester Edward Quintall sailed for Egypt in February 1915. Between June and August 1915 while serving at Gallipoli with the Auckland Infantry Battalion he was twice admitted to hospital with influenza, and during the same period he was once admitted to hospital on Mudros suffering from dysentery. Quintall was evacuated from Gallipoli suffering from influenza in August 1915 and was hospitalised in Egypt. He returned to New Zealand in October 1915. After further treatment and periods of sick leave Quintall was discharged from the NZEF as no longer physically fit for war service on 10 May 1916. His personal file notes that he was suffering from asthma as result of his war service, but unfortunately Quintall's medical papers and correspondence were merged with his pension file in 1926 and this was subsequently lost. On May 2, 1919 Lester Quintall died of tuberculosis on Norfolk Island. His death was noted on his NZEF personal file. On 11 December 1930, Quintall's next of kin were sent the memorial plaque and scroll given by the New Zealand government to the next of kin of all NZEF personnel whose death was attributable to their war service. The New Zealand Defence Force conclusion is that the few surviving references to Lester Quintall's medical conditions make it clear that he developed serious problems with his lungs while serving in the NZEF. His next of kin would not have been issued with the memorial plaque and scroll unless the New Zealand authorities were satisfied that Quintall's death was attributable to his war service. This decision may well have been based on evidence that is no longer in existence because of the purging of NZEF personal files. The NZDF concludes that Private Lester Edward Quintall should, therefore, be added to the appropriate First World War rolls of honour. The Secretary for War Pensions has also reviewed this case and concluded that Quintall’s death was attributable to his war service and that he should be added to the appropriate rolls of honour. George was born Dunedin November 18 1884. He was the son of Albert and Ada Everett of Nelson. Copy of article in Evening Post 1917 (from Papers Past). Approximately 73 DFCs to New Zealanders in 1942.